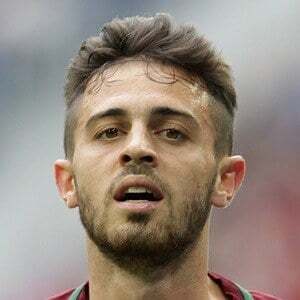 Midfielder for Portugal's national team who spent 2014-2017 with the Ligue 1 club Monaco before joining the Premier League team Manchester City in July of 2017. He was brought up through the youth system of Benfica, helping them win a 2012-13 Portuguese Juniors Championship. His first year with Monaco was spent on a one-year loan from Benfica. He was the Segunda Liga Breakthrough Player of the Year in 2013-2014 and the UNFP Player of the Month for January of 2017. He was born Bernardo Mota Veiga de Carvalho e Silva in Lisbon, Portugal. He replaced Lucas Ocampos in the second half of a match against Girondins de Bordeaux to make his Monaco debut.